Chef Tracy Chang is the mastermind behind PAGU, an intoxicating cross-pollination of Spanish and Japanese cuisine in the heart of Cambridge, MA. Chang has always had a knack for inviting you into her culinary memories—and her current menus read like a flavor-packed international dreamliner. It's New England, it's fall, there are some really awesome mushrooms out here. It reminds me of my favorite mushroom pintxos bar in Spain called Ganbara, where the entire bar is just lined with mushrooms. They were always seasonal, so it might be porcinis or black trumpets, but they’d line the entire bar. You’d pick your product and they’d cook it really simply in the back; a la plantxa with an egg yolk, olive oil, and baguette, maybe some foie gras. One of the ways that we celebrate that at [PAGU] is shiitake a la plantxa, where we hit it with some olive oil, fino sherry, and a little bit of soy sauce to bring out that umami. If you have a matsutake versus maitake mushroom, one is super nutty and the other’s piney and woodsy...I immediately gravitated towards the wild mushrooms, because I like having different mushrooms at once for flavor and texture. Share Chang’s love of a great mushroom moment? 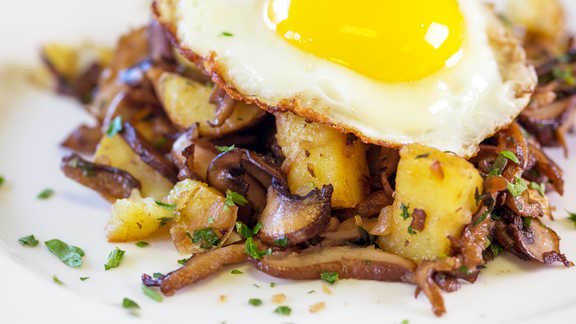 Check out this hash from our partners at The American Egg Board, where a crispy fried egg is perfectly poised to add even more depth to a tangle of wild mushrooms. To see their full treasure trove of chef-created recipes, click here! 1. Melt bacon fat in a 12” skillet over medium-high heat. Add all mushrooms to the pan with a little bit of salt, and cook until most of the moisture has been cooked out, about 7-10 minutes. Add shallots to the pan of mushrooms and cook until soft, about 3 minutes. Remove mixture from pan and set aside to prepare potatoes. 2. Melt 2 tablespoons of butter in the now empty mushroom pan over medium heat. Add the potatoes, salt, and pepper and cook until golden brown and tender, about 8-12 minutes. Return the mushroom mixture back to pan with the potatoes. Add herbs and stir to incorporate. Lightly pat down the whole mixture into a single layer and allow to cook until a light crust forms, about 3-5 minutes. Remove mushroom pan from heat, and place at the back of the stove. 3. In a 12” non-stick skillet, melt the last 2 tablespoons of butter and crack open the eggs into a single layer on the bottom of the pan. Season with salt and pepper and cook until desired doneness (a runny yolk will be amazing for this recipe). Place 2 fried eggs on top of a portion of the hash and top with 2 tablespoons of chopped bacon and a pinch of leftover parsley.